Earlier this year, the partnership’s original target of £500,000 was revised to £1,000,000 as a result of Coral’s outstanding fundraising – and just this month, that target was beaten once more. 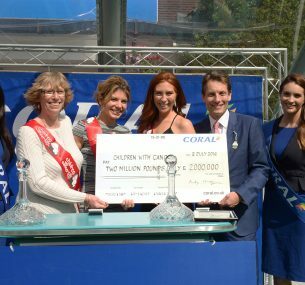 Coral celebrated the 40th Coral Eclipse Stakes at Sandown on Saturday 4th July, where they presented the impressive £1,000,000 cheque to Children with Cancer UK live on Channel 4 Racing. The fantastic achievement is, without a doubt, a testament to the varied and dedicated fundraising shown by Coral staff and customers. Shops continue to hold regular fundraising events such as bake sales and summer parties and staff push themselves to their limits by taking on challenge events of all shapes and sizes. These activities along with proceeds from the sale of scratch cards across the UK all contributed to reaching this milestone for Children with Cancer UK. Every penny we raise makes a difference to the lives of young people affected by cancer and we will keep up the momentum – we assure you of that. The partnership with Coral will continue until the end of 2015, raising more money and awareness for our life-saving research into childhood cancer. We are delighted to have reached this amount so soon. Every penny we raise makes a difference to the lives of young people affected by cancer and we will keep up the momentum – we assure you of that. We’re enormously proud of our charity partnership with Coral and we have been overwhelmed by the generosity of staff and customers alike. They have raised a fantastic amount of money – and their fundraising activities are still going strong. These vital funds are being put to good use immediately so that more young lives can be saved today and in generations to come. Our heartfelt thanks go to all the team at Coral.